There are many games you can play with your kids, but cake games truly take...well, the cake. 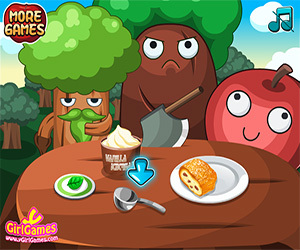 Apple Strudel includes everything about baking, it allows players to do everything from cutting up the apples, to turning on the hot plate and cooking the mixture, preparing the baking sheets. It is visually beautiful, easy to play and teaches the full steps to making Apple Strudel. It is not often games are delicious and make your mouth water, but Apple Strudel does just that. One of the best parts of the game is that you cut up all the pieces of everything you need, stir the mixture and learn about everything that goes into the making strudel. 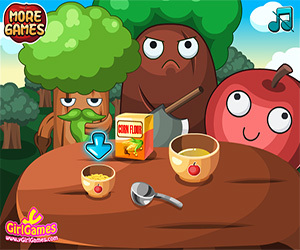 The only flaw with the game is that you can't reach in and enjoy the mixture, but the three individuals standing around the table seem to be on board with enjoying it!